President Vladimir Putin is expected to attend the ceremony marking the commencement of South Stream construction on Dec. 7. The head of state will be on hand because this is no ordinary construction effort. South Stream is one of the Kremlin’s most important and political energy projects of the decade. The need for South Stream was first proclaimed in 2005. Like the recently launched Nord Stream, the project has become a response to multiple “gas wars” with Ukraine, which holds a monopoly on the transit of Russian natural gas to Europe. Russia exports 150 billion cubic meters (bcm) of gas annually, 100 bcm (3.5 trillion cubic feet) of which pass through Ukrainian territory. Russia’s Gazprom and Italy’s Eni signed a memorandum on the construction of the new pipeline in 2007. Other countries have since jumped on board; existing shareholders of the Netherlands-incorporated South Stream Transport AG include Gazprom (50 percent), Eni (20 percent), France’s EDF and Germany’s Wintershall (15 percent each). South Stream is set to become the largest and most expensive existing or contemplated pipeline in the history of Putin’s Russia. It will run from Dzhubga under the Black Sea, with a main line running to Travisio in Northern Italy, through Bulgaria, Serbia, Hungary and Slovenia (with a side branch to Croatia). Its total length will reach 1,463 miles, including 559 miles offshore and 904 miles onshore. Two more lines will run from Bulgaria, through Serbia and Hungary, to Austria’s Baumgarten — the largest natural gas hub in the middle of the European Union (EU). Another southbound branch will run from Bulgaria, through Greece and across the Adriatic Sea, to Italy’s Otranto. Finally, yet another pipeline will cross the Black Sea and surface in Romania, joining the other lines in Serbia. South Stream’s capacity will be 63 bcm of natural gas annually, although only half this amount was planned before 2009. The launch of the first 15.5 bcm line is scheduled for the end of 2015, with deliveries expected to begin in the first quarter of 2016. The natural gas pipeline should reach its full capacity in 2018. No one knows for sure how much all of this will cost. Gazprom estimated the project’s cost at 15.5 billion euros ($20.2 billion) in October, but after a number of “revisions” the price tag has risen to 16-17 billion euros. The gas monopoly has all but officially admitted that the final cost could be even bigger. Valery Nesterov of Sberbank Investment Research pointed out that Gazprom will have to spend an additional 10 billion euros or so to expand Russia’s integrated gas supply system near Anapa, in order to enable it to accommodate the required gas throughput. This will bring the total project cost up to almost 27 billion euros. In order to lay the onshore portion of the project, Russia has signed intergovernmental agreements with Bulgaria, Serbia, Hungary, Greece, Slovenia, Croatia and Austria. The offshore section required an agreement with Turkey. Gazprom had to make painful concessions in exchange for almost every agreement, a government source stated. Among countries where the onshore section will be, it was Bulgaria that presented the most problems, the source told Kommersant-Vlast. It was only on Nov. 15 that Gazprom CEO Alexey Miller managed to reach a deal with the Bulgarian government. The gas giant also had to help Bulgaria’s economy by cutting prices for its gas sold there. In exchange for agreeing to participate in South Stream, Bulgaria received a 20 percent discount on natural gas supplies (effective January 1, 2013), although Gazprom had originally planned to give it an 11 percent rebate. Sofia has also secured the right to purchase natural gas directly, rather than through a joint venture, as it does now. According to Miller, the price for Bulgaria will be among the lowest, even though the country buys around 3 bcm of natural gas annually. Gazprom will also assume some social obligations in Bulgaria. For example, the company will sponsor Bulgaria’s Levski soccer club, which will now grace Gazprom’s soccer empire with Russia’s Zenit, Germany’s Schalke and Serbia’s Crvena Zvezda. “It’s impossible to estimate the actual scope of all the benefits offered to project member countries now, so the final price of South Stream is a moot question,” a Gazprom top executive said. Besides the tough bargaining it had to do with its future partners over all these years, Gazprom has had to face another powerful player: namely, the EU and, more precisely, its governing body, the European Commission. Brussels had long called Europe’s dependence on Russian natural gas a threat and thus tried to informally hinder South Stream by supporting rival projects — the Nabucco pipeline being the most important. 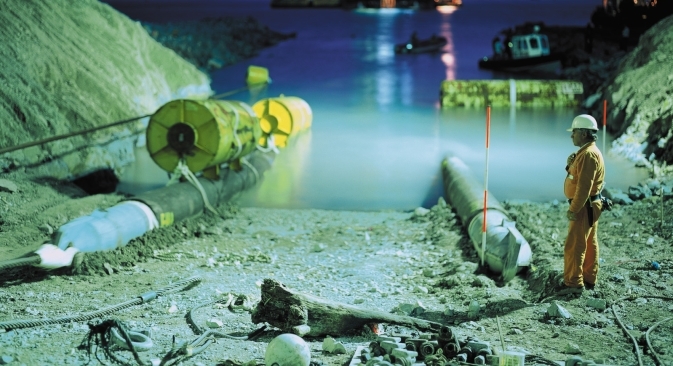 When European Commission President José Barroso presided over the signing of an intergovernmental agreement on Nabucco in Turkey in 2009, it seemed as though that pipeline would be built faster than South Stream. This never happened though, partially because of ballooning costs: the originally estimated 8 billion euros grew to 20 billion euros. Still, the main reason was that Nabucco failed to secure a proprietary resource base. Supplies from Northern Iraq turned out to be too risky, while Ankara was reluctant to support Iraqi Kurds by buying their natural gas. The Egyptian option was derailed by the Arab Spring, the Syrian war and rising tensions between Cairo and Tel Aviv. A Trans-Caspian pipeline was never built, due to Russia’s unyielding position on the division of the Caspian Sea. Nabucco’s last hope, Azerbaijan, now prefers other projects.